WhatsApp seems to be testing another weapon in its arsenal to battle fake news – a label for messages forwarded five times or more. 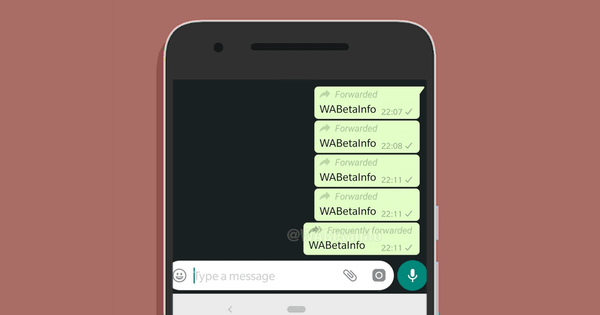 Last week, WABetaInfo reported that in a new beta version of its Android app, WhatsApp added counts for how many times a message has been forwarded, as well as a ‘frequently forwarded’ label. On its own, this feature will alert users about viral messages; the idea, presumably, is to encourage them to question the veracity of the contents of such messages doing the rounds on the platform. But on the flip side, the new label might encourage people to forward the message along to as many people as possible, because it’s going viral. If WhatsApp plans to roll this out, it should ideally communicate its purpose clearly, so as to avoid misinterpretation. Last year, the company began taking measures to curb the spread of misinformation through its messaging service; it introduced a limit in India on forwarding messages to five contacts at one go. This was subsequently extended worldwide. The company said in January that during its trial of the feature in India, it saw a 25 percent reduction in forwards. But, it’s hard to quantify if that has actually helped to reduce bogus news from being circulated. It’s also hard for WhatsApp to track the sources of misinformation on its platform, because messages are encrypted end-to-end, and can’t be intercepted or read by anyone except the sender and their recipients. All the company can do at this point is to give people tools to identify and verify whether the messages they receive are legit. To that end, it’s also been testing a feature for reverse image search, which could help users see if a picture they’ve received is legit, or has been doctored. Even with these tools, it’s left to users to do the legwork of verifying messages and images through trusted news outlets and fact checkers. That’s not always easy, especially for many people in developing countries who are coming online for the first time, and aren’t surrounded by a culture of questioning the legitimacy of information they receive through digital services. There’s also a threat of propagandists using various methods – like Photoshopping images, or adding fake quotes and captions to genuine images – to make it difficult for people to find the original information and imagery online. That may be beyond WhatsApp’s reach at this stage. With these features, the company’s silently acknowledging the problem of misinformation problem on its platform, and it looks to be carefully exploring ways to solve this without eroding people’s trust in its service. WhatsApp will still have to educate and encourage people to take extra effort to verify the information they receive from their contacts – something that might not make sense or hit home for a lot of users. However, these are generally steps in the right direction, and hopefully, they’ll be implemented soon enough. TNW Conference 2019 is coming! Check out our glorious new location, an inspiring line-up of speakers and activities, and how to be a part of this annual tech extravaganza by clicking here.